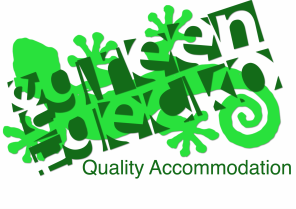 The Green Gecko - Ashburton Accommodation - Places to dine in Ashburton - The Green Gecko - Ashburton Accommodation. Accommodation Ashburton Ashburton Accommodation - Restaurants / Cafes / Eateries / Fast Food. We have a great range of Beers, Wines, Whiskeys & Liquers along with the very best Vivace Coffee and fantastic selection of cabinet foods in our Cafe. PLUS we have a fantastic KIDS PLAYROOM equipped with cartoon TV, toys, colouring books, bean bags and more. Whether it's a light lunch, a coffee and cake or a full dining experience, Bedrock Bar & Stonegrill can cater to your needs. 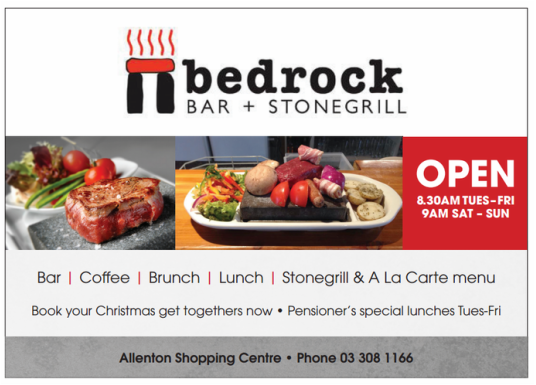 Situated in the newly updated Allenton Shopping Centre, Bedrock offers great parking and a huge outdoor dining area. Browse our website and check out the full menu, and send us a message if you would like to book a table or enquire about private functions. Just down the road from your Ashburton Accommodation at the Allenton Shopping Centre. 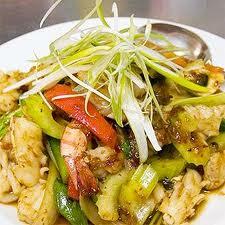 If you are after an affordable meal out where you leave feeling "fed up" try the Charming Thai Restaurant. "My husband and I recently had dinner here and really enjoyed our meals. I had stirfry seafood with vegetables in a pepper sauce (mild), my husband had a calamari dish (med) and we had rice for two. We were the only diners as we had a very early dinner but some people wandered in and out for takeaways. My dish was full of seafood (prawns, mussels, squid) and a good size portion, same with my husband. The bowl of rice was plenty for two people, we were really hungry so managed to finish it. For a seafood dish to average $16/17, we found this to be extremely good value for money. 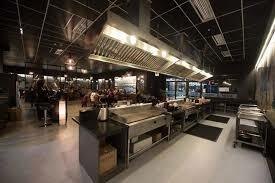 Would dine here again." To view this and other reviews about the Charming Thai Restaurant on the "Dining Out" website click HERE. Ring and book to avoid any disappointment. 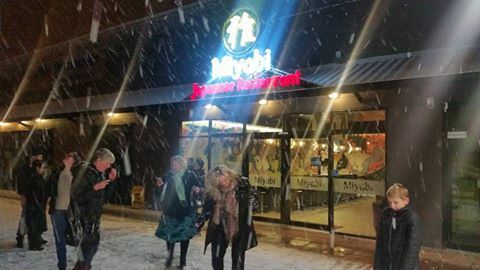 This new restaurant has been extremely popular since opening in Ashburton. Welcome to this multi award winning eatery has been nourishing the locals and travelers from around the globe, with menus of fresh regional cuisine, hand crafted on premise. Food is our passion! An ideal stop for breakfast, lunch, dinner, or coffee and a snack. Spray free and free produce. 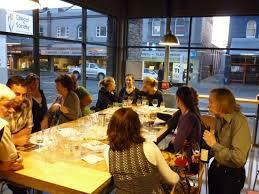 Exciting wine lists and 100% organic & fare trade coffee. Passionate foodie Vicki Waaka believes in fresh, honest and tasty food. At her well-respected eatery Nosh, she puts her heart and soul into her quality food. Vicki crafts, creates and produces food to be remembered. Her culinary skills have been nurtured over many years in the food industry. She uses fresh ingredients, free-range and spray-free products whenever possible, and blends them together with enthusiasm. “Fresh ingredients, creative combinations and a bit of love in the cooking process all contribute to what the customers got on their plate,” says Vicki. She owns and operates Nosh with husband Rangi and both believe in excellent customer service, as well as friendly and efficient staff. Nosh will shortly start up its evening restaurant service and Vicki can't wait to plate up some of her trusty favorites, as well other new and exciting dishes. Open 7 days - Monday to Tuesday 9.00am til 5.00pm / Wednesday to Saturday 9.00am til late / Sunday 9.00am til 4.00pm - Click here to view the Menu. If its good hearty portions of Southern food matched with local beer your after then the Ashburton Speight's Alehouse is the place for you. The full range of Speight's beers on tap, including exclusive seasonal beers on tap only to be found at the Ale House. The building itself is steeped in history. It was first built in 1898 as a bank, it has served the community in this purpose for the vast majority of its existence. At over 100 years old, it's transformation to a Speight's Ale House has ensured it continues to command it's place in local history and in the hearts (and stomachs!) of locals. One of the most prominent features of this Ale House is the al fresco dining area, which has a large walnut tree planted by one of the early managers of the bank in the middle of the 50 seat area. Well priced, and a favourite with locals the Speight's Alehouse is famous for its Lamb Shank's, Venison & Lambs Fry. Whether it be live sport on the Big Screen, a beer or two with some friends, or just relaxing in the sunny beer garden the Ashburton Alehouse has something for everyone. experience versatility, elegance and a vibrant atmosphere, at the newest restaurant in the region – braided rivers restaurant + bar. named after the ever-changing rivers of the rakaia and rangitata, which flank the mid canterbury region, braided rivers restaurant + bar has something for everyone. Bar - at braided rivers restaurant and bar, we have heineken and a selection of monteith’s beers on tap, plus a few other surprises; one of which is the new monteith’s crushed apple cider on tap! the wine list boasts a selection of local and imported wines. speak to your waiter for their pick of wine to complement your meal. Restaurant - the dining area offers comfort and intimacy, with plush carpet, comfortable seating and enticing, delectable cuisine from a range of menus. meet friends or colleagues on a friday night for a cold drink in our bar area. our bar features hidden nooks and crannies for a cosy chat, as well as generous open space for dancing the night away. At Indian Minar restaurant we serve a delicious combination of North and South Indian cuisine, cooked to high standards, accompanied by excellent customer service and served in pleasant surroundings. 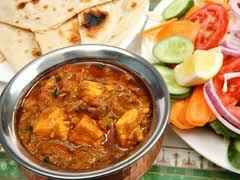 Our broad menu incorporates many classic dishes traditionally served in Curry Houses. 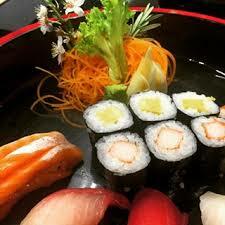 However, these are accompanied by a new wave of more authentic dishes. We have also taken a number of steps to make every dish on our menu as healthy as we can. Indian Minar's unique recipes reflect our head chef's own inspiration and some of the improved dishes introduced by New Zealand's best Indian restaurants over recent years. This Club which holds a Permanent Charter is affiliated to Clubs New Zealand (Inc) and therefore welcomes members from other affiliated Clubs throughout New Zealand and Australia. Visitors from other parts of the world are welcome to call and apply for visitor status while in Ashburton. We offer a courtesy van service at no charge on Friday from 4pm and Saturday evenings from 5 pm and all members, guests and affiliate members are welcome to use this. The Club is also serviced by the local taxi companies and has parking available. Phone 'Bottle Store' for bookings on 308 7149. Bookings must be made 30 minutes before pickup time. Welcome to the Lake House Restaurant, Cafe & Bar Lake Hood, Ashburton, NZ"Delectable cuisine, fine wine and incredible views- the Lake House secret”The Lake House is one of Canterbury’s best kept secrets. 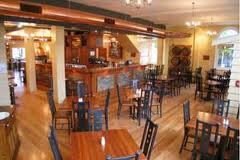 Situated on the edge of Lake Hood, the Lake House Restaurant hasboth indoor and outdoor dining. Meals are individually cooked fresh to order from locally-sourced produce. Take some time out of your busy schedule to relax with us at the Lake House. The Lake House Restaurant & Cafe has interior seating for 120 diners with external seating for a further 50 to 100 guests. We also have two separate conference rooms available for groups. We have inside and outside areas where visitors to Lake Hood may sit and relax with a cool drink & a selection from the bar menu. 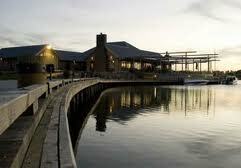 Nestled in Marina Bay, the Lake House is open for Brunch and Dinner seven days a week from 10.00 am until late. To ensure your visit is a pleasant one, please allow yourself enough time to unwind and enjoy the experience. We will be open from 10am until late every day except Christmas Day with no public holiday surcharges. To view a map on location and directions on how to get to The Lake House at Lake Hood, Huntington, Ashburton. Click HERE. NB: Should allow 10-15 minutes to get out to Lake Hood. 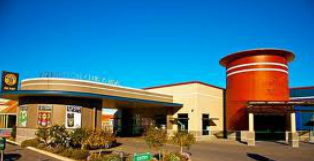 Great place to visit and worth the drive. Somerset Grocer, Ashburton, is all about great food…At the Somerset Grocer, we love great food and take pride in bringing you the best local and international produce, in a great shop atmosphere. 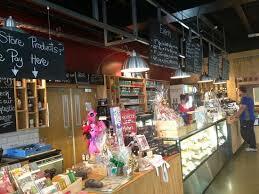 At our Ashburton gourmet grocer you’ll encounter new products and tasty delights with each visit. We are conveniently located just off the main street of Ashburton, on Burnett St. Look for us on the ground floor of the new Somerset Building. Robbie’s is well known for our great atmosphere, friendly staff and a vast selection of Kiwi cuisine with meals to suit anyone’s appetite. Our bars have a large range of quality beverages including New Zealand beers and wines. We also have several wines from the award winning Torlesse Winery in Waipara, North Canterbury. To view Robbies Menu click HERE! 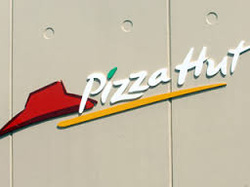 Order on line (http://www.pizzahut.co.nz) or phone 0800 83 83 83. Accommodation Ashburton - The Green Gecko Holiday Home - Ashburton, NZ. Accommodation Ashburton Ashburton Accommodation - Restaurants / Cafes / Eateries / Fast Food.